I introduce you to the perfect party appetizer. Heat oil in a large skillet to 350 F. You do not need to fill the skillet full, two inches of oil is plenty. I cut my wonton wrappers into rectangles (I used about 1/3 of the wrapper and discarded the rest). For simplicity’s sake as well as to avoid waste you could cut your wonton wrappers into quarters to create 4 small squares. They may look small to begin with but once they hit the oil they double in size. These only need to be fried for 1-2 minutes or until lightly browned. Remove from oil and place fried wonton wrappers on a bed of paper towels to absorb any extra grease. Sprinkle with salt while hot. In a medium sized bowl whisk together all ingredients for the dressing. Add cabbage, carrot, cilantro and green onion and stir to coat in the dressing. In a small mixing bowl combine all ingredients for the wasabi aioli. Season the tuna with salt and pepper, and then incrust in sesame seeds (all sides). Heat a skillet to medium high heat and sear the tuna on each side for approximately 1 minute per side. Remove and slice thinly. 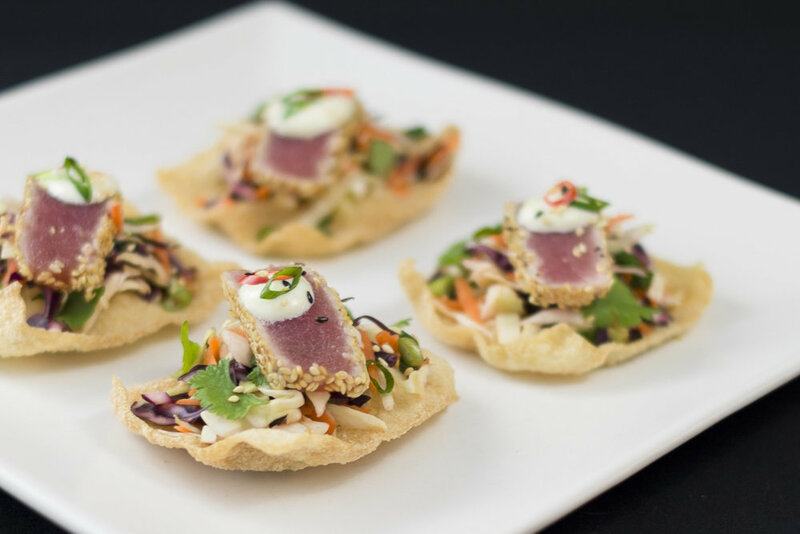 To assemble place slaw on top of the wonton chip, and then add the sliced tuna, drizzle with aioli and garnish with extra cilantro, sesame seeds, and red chilies.